At this holiday time of year, our whole family is grateful for all the love and support we receive. I’m often asked how it is that we’re so strong. My first response is to say that we draw all our strength from “the girl.” The truth is more complicated. Jordan guides us and gives us the energy to be optimistic and brave. But we don’t travel on this journey alone, and we would be lost without the constant kindness of people we’ve known forever and strangers we’ve only just met. Holidays are a strange time for our family. No one knows how to behave anymore. We have fragile expectations. We roll through the festivities as easily as we can. This year has been a little harder than others. Neither Jeanette nor I have had much of the holiday spirit. There’s no particular reason. We just don’t feel it. Jordan’s new clinical trial doesn’t help. She’s doing fine, but she sleeps constantly. She is awake for only a few hours every day, and then she’s kind of out of it. It’s gotten worse since the doctors added new medication to try and bring her tremors under control. The new meds are essentially muscle relaxers. She’s very relaxed, but rarely alert. Since many of Jordan’s muscles are still recovering from surgery, the muscle relaxers are creating other problems. She falls a lot because her legs are weaker. And she has “accidents” in the middle of the night that disrupt her sleep and hurt her self-confidence. Still, when she’s awake she’s loving and as optimistic as she always is. She had a very nice Christmas. And she’s looking forward to the new year. We all are. She was very excited to receive a new handbag for Christmas. She’s taken to napping on the sofa. 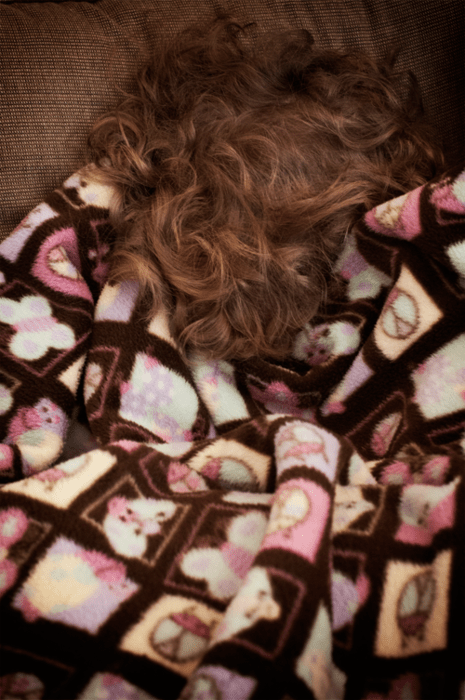 Her favorite way is to wrap herself up in a blanket and curl up in a ball with just her hair peeking out.